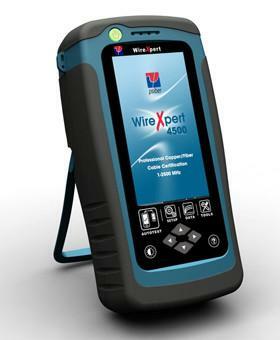 Once the test cords are verified, you may test the fiber link. There are three options for setting an optical reference between a source and power meter. These options may use 1, 2 or 3 jumpers, or Test Reference Cords. The method used is determined by your regional or vendor-specific requirements. A couple of things should be noted. Optical Loss Test Sets (OLTS) typically have a source and meter at EACH end so they measure two fibers at one time. For simplicity and clarity the graphics here are only showing a simplex setup – one light source to one power meter (except in testing setup with 2 reference cords, that shows both links). 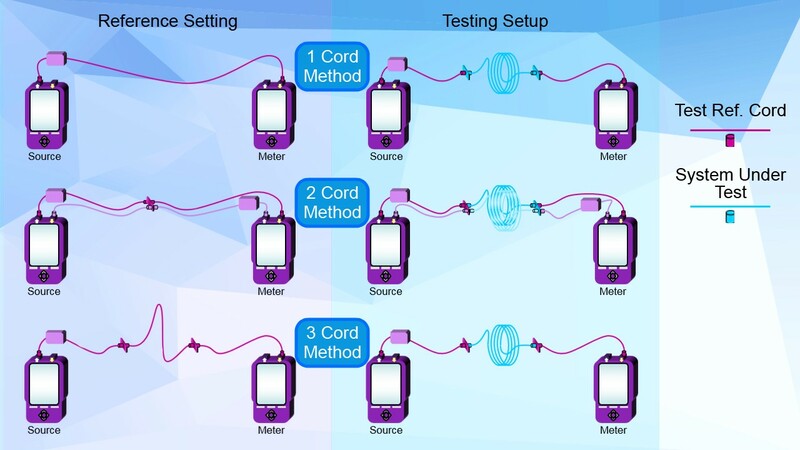 When the term “test reference cord” is shown this means a cord with “reference grade connectors”. These are connectors that provide much lower loss than “standard” connectors. Test reference jumpers are more expensive than regular patch cords. A couple of final notes on referencing: Regardless of vendor or model, all optical sources should be allowed to warm up for about 5 minutes prior to performing a reference. On most Optical Loss Test Sets designed for Tier 1 certification, there will be a setting for “reference method”. The physical configuration used to perform the reference MUST match the setting on the test device or your test margins are invalid. So if you set your test setup to do a three fiber reference but what you actually physically do is a one fiber reference, you have a completely invalid test result, especially your test margins are going to be completely invalid. NEVER disconnect the test jumper from the transmitter after a reference is performed – this will destroy the reference – you will need to do it again. Always check your reference by connecting the source test jumper to the power meter test jumper and perform a measurement. There is some variation in what you would expect to see when checking your reference – based on the quality of your test jumpers and the reference method used, certainly below 0.3 dB. One thing you want to watch for when checking your reference is ‘gainers’ – where your test set shows a loss with a positive value, +0.2 dB for example. That is also an indication that you’ve got a bad reference and you’ll need to redo your reference. It is a good practice to save your reference check to have proof that a good reference was established prior to testing. If during the course of testing you question your results, simply check your reference again and re-reference if needed, save the result and carry on testing.